Drawing only 65uA during normal operation, this board is perfect for applications where battery life is critical. It interfaces directly to Vegetronix soil moisture sensors, and has a variable resistor which set's the relay trigger point. Because it uses a low power latching relay, it only requires a brief pulse of current to update the state of the relay. The soil moisture sensor is sampled every 10 minutes to update the state of the relay. It has 2 LEDs to indicate that the board has power, and the on/off state of the relay. For low power mode the LEDs can be disabled with a simple jumper switch. It can be wired in series to valves including latching valves and block watering events from a valve clock. The VG-RELAY-LATCH board interfaces to a single VH400 soil sensor, and can activate a low power AC load such as a valve or alarm, or other control device, when a moisture level is reached. The threshold is easily set with the onboard variable resistor, and a small screwdriver. The relay board can be configured with a jumper to turn the relay on when the sensor detects wetness or on when the sensor detects dryness. This board has a special configuration mode, which can be entered by setting a jumper. In configuration mode, the LEDs are active, and the sensor and variable resistor are continuously updated. This mode consumes more power, so it should not normally be used beyond initial calibration. 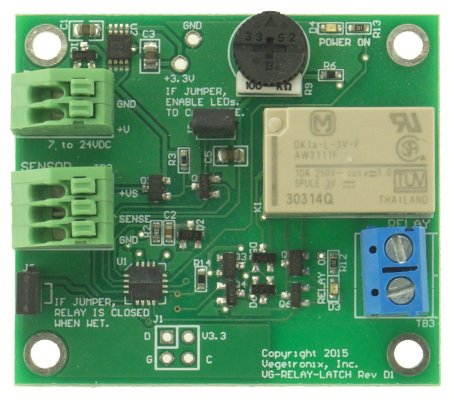 The VG-RELAY-LATCH also serves as an evaluation board. If you are thinking about testing our VH400 soil moisture sensors you should consider purchasing this board as well. Battery operated valves and control systems. Interruption and control off irrigation and sprinkler systems. Interface soil moisture sensors to home automation systems. Samples the sensor and updates the relay approximately every 10 minutes. Has a special real time configuration mode, where LEDs are active and the sensor and variable resistor are read continuously. Can control a 10A load up to 240VAC. LED indicators, indicate power on and relay contact. There is a jumper on the board, namely J2. (It's a black 2 pin header.) Make sure it is shorted with the black plastic jumper. When it arrives this should have already been shorted with the jumper. Insert the sensor into terminal block TB2. Red wire to +5, Black to Sense, and Bare wire to GND. Power the board with 9VDC, or 9V battery to terminal block TB1. If the jumper is on correctly, the power light should come on. The LED D4, says "POWER ON" underneath it. If the power light doesn't come on and the jumper J2 is in place then you've probably hooked up the power incorrectly. The relay LED will now also be operational with the jumper in place, but with there is a nuance to it. The potentiometer is only read about ever second - it is not continuous. So you must adjust it very slowly, and incrementally. If you turn it to fast, it wont be read and you will overshoot. Adjust the pot until you have it at the correct level. The LED light will either turn on when it passes the threshold set by the pot, or off when it has not. The polarity jumper J3 can be used to reverse the polarity of the relay, from normally closed to normally on. This can also be used to verify that the relay light is working. If the relay light is off, it should turn on with one of the cases: of the jumper being inserted, or removed. The best way to get started is to order a few low cost probes and relay boards and try them out in your application.